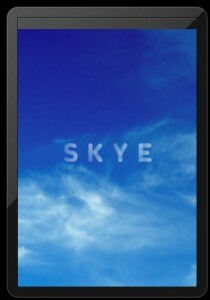 SKYE Weather+Photo is a free weather app for the iPod/iPhone. This app is like every other weather app. Only two things set this app apart from the rest. One, you can take a picture to show other people what the weather looks like in your area. Two you can make a comment to describe the weather. These two things are enough to make the app more interesting then the other wether apps. 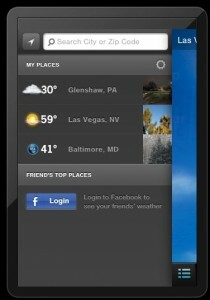 You can also link your weather app to your Facebook or Twitter. This is fun because if you have other friends with the app you can see what the weather is like around them. This app gives you the standard weather views. 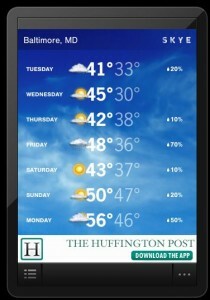 Current conditions, five day forecast and hourly forecast. There’s also a screen for browsing other user’s weather photos. This feels a little like a photo stream. 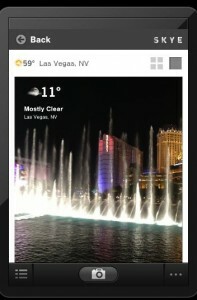 All of the photos have an overlay stating the location and weather condition. From here you can also repost, comment or flag. There isn’t an explanation as to what the flag is for. It would be nice if there were a short tutorial or slideshow explaining what all of the buttons and functionality are. The majority of the reviews in the app store are positive. One of the reviews makes the comment that a picture is worth a thousand words and I agree. 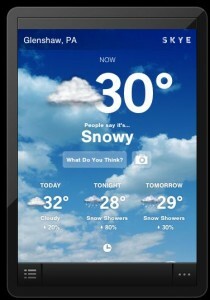 It would be great to see an iPad version with animated weather maps.